Description: I'm sensing a pattern with newer releases in the Stoneworx line. All of the recent inlays have followed that of the Stoneworx Canoe. The little knife takes some getting used to because of its size. There is gimping on the spine of the blade to provide better handling. Beyond cutting boxes it might be useful for some detail work but I think this is more of a show piece than a true working knife. 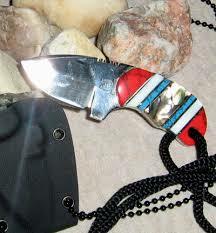 I hope to see more useful fixed blades in the Stoneworx line. Unfortunately, Rough Rider Opted to release this knife in the plain blue denim Rough Rider box instead of the old Stoneworx box.